I was working as an usher at My Chemical Romance’s Melbourne concert as a part of their second Australian tour when a fourteen year old girl and her mother tapped me on the shoulder. The girl was smiling and had tears streaming down her face as patrons shuffled towards the exits after a memorable performance. I was expecting to be asked where they could buy merchandise, but the mother asked if there was any way her daughter could meet with the band. This is also a common enquiry, and easily dealt with through a simple ‘No.’ The girl gave me an envelope addressed to My Chemical Romance, with the underlined plea ‘Please read!’ and miniature roses taped to a corner. She asked if I could see that the letter was given to the band, should I run into them during the course of my duties. I did my best that night to pass the letter on, but to no avail. The letter sat unread in my scrapbook of ticket stubs and concert souvenirs ever since. Then, more than a couple of years later, Frank Iero, My Chemical Romance’s guitarist, called from the chilly New York winter for an interview, and I mentioned the girl and her letter to him. 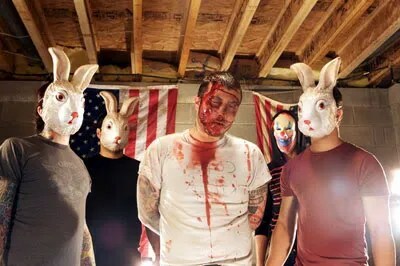 The existing Leathermouth band members approached Frank simply for an opinion on a three song demo of their work so far. ‘As soon as I heard it, I fell in love with it,’ Frank says, and started thinking about lyrics to go with the instrumental tracks he had been played. Before long, he’d offered himself as vocalist and chief lyricist, and I noticed that the lyrics were perhaps more political than those of songs he’d performed with previous bands. Despite having played on some of the largest stages in the world, Frank admits to a certain apprehension when performing in front of large audiences, and has appreciated the return to more intimate shows that Leathermouth has presented. With this in mind, I wondered if the shift from the relative security of a guitarist standing behind a charismatic singer to the position of front-man would pose a problem for Frank. Leathermouth’s debut album XO is out this month. From Buzz Magazine, March 2009.